There is perhaps not a more popular luxury wagon than the Audi A4. Its design features have set it apart from all other vehicles in its class. 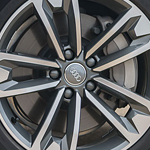 This is why our team of luxury wagon experts at Audi Pensacola are so excited to announce the arrival of the all new model! One of the best design features is the hands free lift gate. Simply swipe your foot under the tail gate of your vehicle and watch in amazement as it begins to open. This makes loading and unloading easier than ever before. Next, car buyers will also love the keyless ignition in this vehicle. This way, you'll never have to fight in your pockets or purse to find your keys again. Simply have the keys in the car with you and you're one button away from driving. Audi engineers have truly thought of everything in this new model.